The municipal hall in Famagusta, is located along the main street with the administration buildings built during the British mandate, connecting back then, the walled city entry of Famagusta populated mainly by Turkish Cypriots with the Varosha area, populated mainly by Greek Cypriots. The Municipal hall was built in 1966, designed by Toumazis. It is organized in a V shape floor plan, following the geometry of the two convergent streets. It has a lower volume at the front and two linear ones on both sides. The lower front volume stands on V shape piloti. 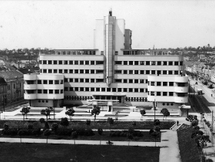 The west façade of the two top floors are covered with slim concrete louvers. It is located just outside the ghost part of the city that is inaccessible due to its control by the Turkish army. 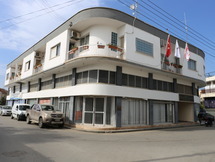 The municipal building sits in an area that is supposed to be handed over to the administration of the South Region to be created under the Federal State of Cyprus, where the Greek Cypriots will have a majority role. Unfortunately, this new political model is falling short since the negotiations between the two communities have stopped in 2017. A few initiatives by groups of people from both communities have been working on the city’s future with the scenarios of the island’s reunification. The “Hands-on Famagusta” initiative has made explicit the need to include in the negotiations for the new Federal Cyprus, the role of governance of Famagusta as a unified territory, abandoning the ethnically binary way of administration. The on-going discussion seems to adopt the creation of a Turkish Cypriot and Greek Cypriot administrative territories under competing municipalities. The future of the municipal hall remains ambivalent.